The Catholicon, written by the Dominican Johannes Balbus (d. 1298) of Genoa, is a long treatise for the study of Latin, divided into five parts: orthography, prosody, grammar, rhetoric, and etymology. This copy was owned by the Augustinian priory at Stone in Staffordshire (half-way between Stoke-on-Trent and Stafford). 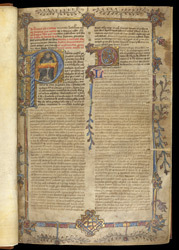 The opening page is adorned with a full border, historiated and illuminated initials. The heading is written in red and black in a decorative chequered pattern. The historiated initial shows the author writing the text; just visible are his ink-pot, at the left edge of his writing-desk, and a blue weight hanging on a cord over the edge of the desk.